Twenty five years of experience has taught me many lessons when looking at family history records. 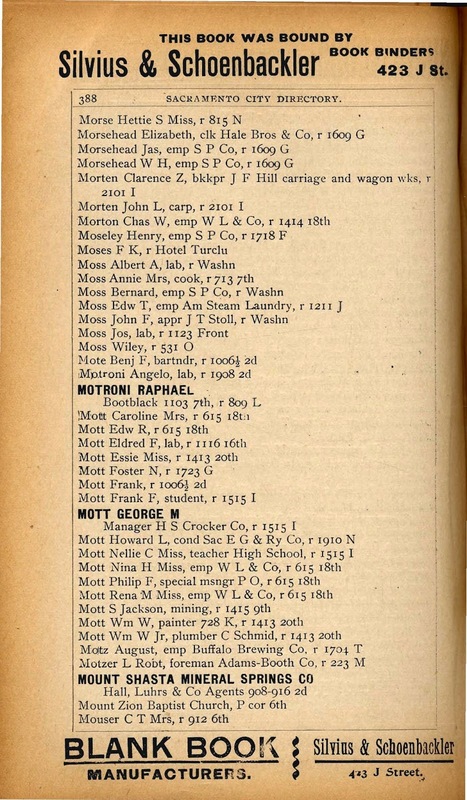 City directories are an example of a genealogical record that requires meticulous analysis. On the surface, a city directory provides somewhat limited information about a family. City directory listings usually give the name, address and occupation of an individual. Upon closer examination, you will see much more information in City Directories than you might expect. For example, let’s use city directories to help piece together the puzzle of two of my ancestors. The oral history passed down to me by my grandmother and grand aunt was that their mother, Mae Blanche Moss 1882-1963 and her mother Anne B. Lanstein Moss 1860-1922 lived in Sacramento in the 1890s. 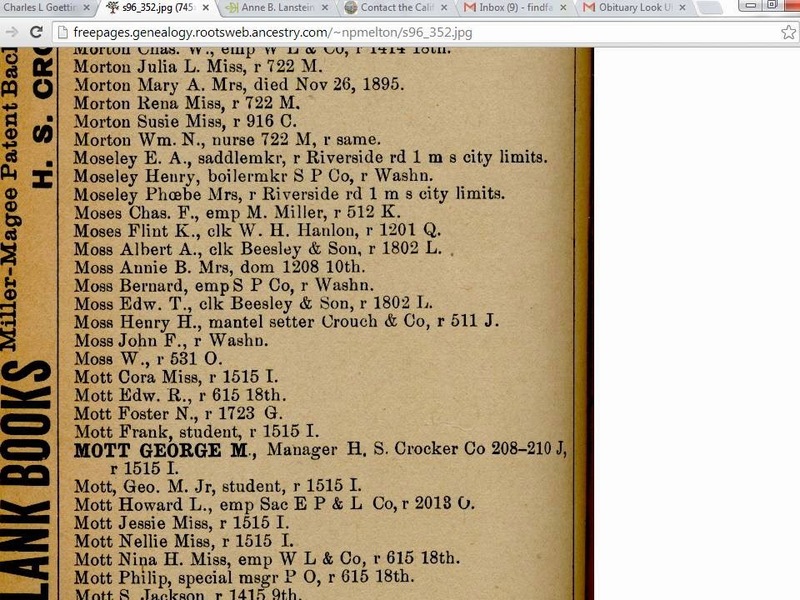 There is a women named Annie that is listed in the Sacramento City Directory in the 1890s. This could be my ancestor but I have not yet found any other records that would definitively corroborate that it is her. If I could have found Annie and Mae residing at the same address that would have been more definitive but alas it is not to be at least for now. I keep looking for more evidence. My grandmother and her sister also told me that Annie and Mae were living in San Francisco together during the 1906 Earthquake. Mae had been working for Mr. C.L. Goetting in a fancy fruit and vegetable market as a cashier. When the earthquake struck they had to evacuate their lodging near the current site of the Fairmount hotel on Mason and California Street. Mae was able to get a gentleman to help her carry her trunk up California Street. Mother and daughter made their way to Golden Gate Park. Eventually they were rescued by Mae’s fiancé, Ernest Coffman and taken to live with his aunt, Viola Coffman Hughes in Oakland. Since Mary A. Moss is listed as a “Miss” it is clear that she is an unmarried woman. It is very common to see widows enumerated in City Directories with their children in the same household. We do not know for sure but we can theorize that Mary A. and William P. Moss are the children of the widow, Ann Moss. I conducted an exhaustive search of the 1900 census to try to find this family. I found the enumeration district of the census that includes the address 7 Liberty. I searched all of the names on Liberty Street. I found a listing for 9 Liberty Street but nothing for 7 Liberty. 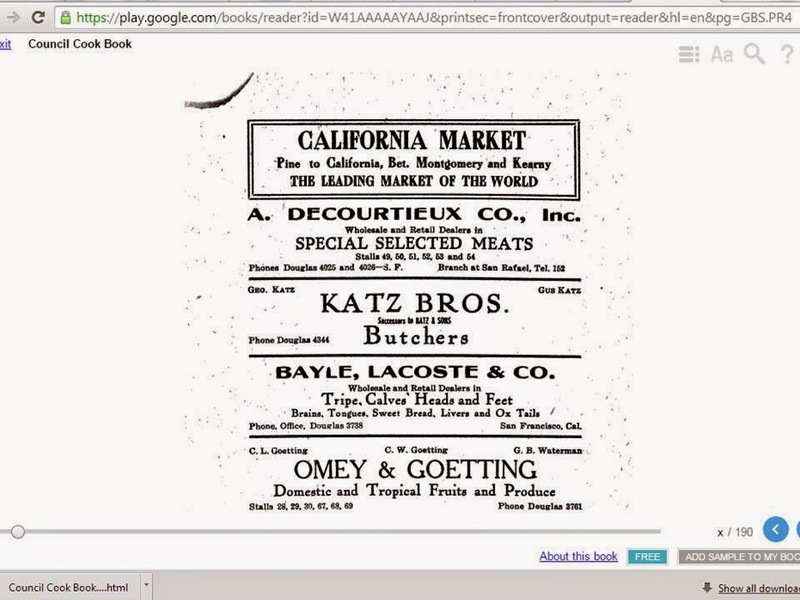 The 1901 and 1902 directories of San Francisco are not available at Ancestry.com. In the 1903 Crocker-Langley Directory of San Francisco we find Miss Moss, the dressmaker is May not Mary. That seems even more promising! 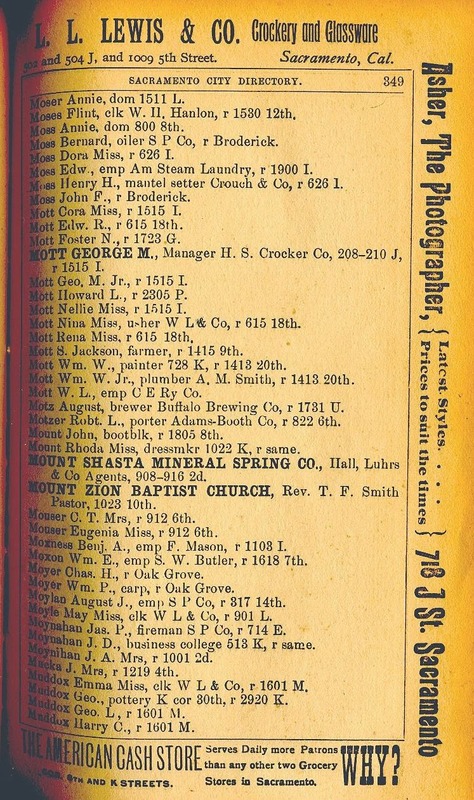 Comparing 1900 with 1903 and 1904 directory listings we see variations in the names. The dressmaker is seen in 1900 as Mary A. and in 1903 she is May A. The widow Moss is first listed as Ann but later listed as Bridget. The first listing for the presumed son is William P., the second listing is Patrick W. and the third listing is William P.
Bridget is shown with a middle initial “A” which helps to tie the family together. Most likely her full name was Bridget Anne Moss. It is very common to see first names and middle names used interchangeably in genealogy records. The census does show that William P. was indeed her son. His full name is most likely, William Patrick Moss as we have seen with the names William and Patrick used interchangeably in the records. However now that we know that Bridget Ann Moss was born in Ireland and that she had a son, William Patrick Moss born 1879 in California, it appears fairly certain that this is not my family. Annie Lanstein Moss and her daughter, Mae Blanche Moss came to California in 1890. There is nothing in our oral tradition about a brother nor is there anything about Irish heritage on the Moss line. There is enough variation in the names to make it difficult to make these puzzles pieces fit together properly. This analysis shows that genealogical research can be very painstaking work. Sometimes you spend a lot of time analyzing records that don’t belong to your ancestors. This can be very frustrating to those who prefer instant results. However, this meticulous analysis is required to insure that we thoroughly prove that a record belongs to a particular ancestor. 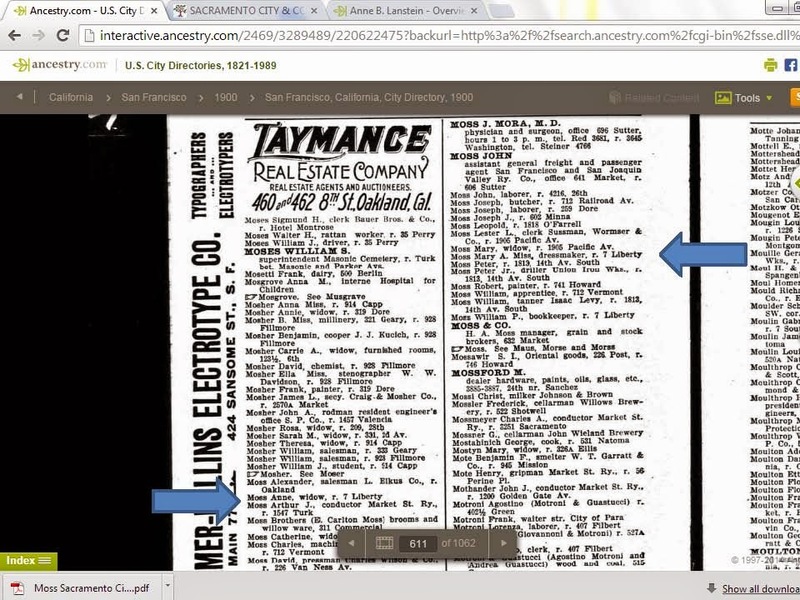 So why are Mae Moss and her mother, Annie not showing up in the San Francisco City directory prior to the 1906 earthquake? The story about Mr. Goetting seems to fit as there are plenty of records that show that he and his fruit and vegetable market did actually reside in the California Market. Is it possible that Mae had another name? She married Ernest Coffman in Oakland on the 5th of February 1907 and the marriage record lists her as Mae Moss, resident of San Francisco. Perhaps she had only recently arrived in San Francisco. The mystery remains unsolved after 25 years of diligent effort. Stay tuned for more episodes of this story.